May is a magical month in the Canaan Valley, where visitors may stroll fields of Allegheny wildflowers while being serenaded by songbirds. Officials at its premier state park, Canaan Valley Resort, have scheduled a line-up of programs designed to enhance the appeal of spring in the highland valley. 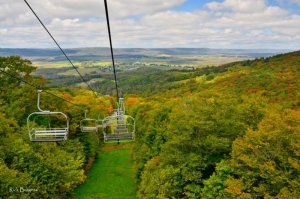 “I’ve lived and worked in Canaan Valley for more than two decades, and from experience I know that May is a great month to appreciate the beauty of the valley,” said Steve Drumheller, general manager of resort. The resort is situated in a wildlife-rich valley surrounded by peaks that rise to more than 4,300 feet above sea level. Temperatures in May tend to be mild and comfortable, which makes the month a particularly good time to explore its many outdoor activities. By the end of May, all summer-season activities are open, Drumheller said. The outdoor pool, the Turtle Slide and scenic chairlift at the ski area open May 27 for the Memorial Day weekend. The golf course and the sporting-clay range – one of few in the state of West Virginia – have already opened for the summer season. Family Trail Days, May 6 – Visitors are invited to take an eight-mile walk between Canaan Valley Resort State Park and Blackwater Falls State Park. The walk begins at Blackwater and includes a mountaintop lunch. There is a registration fee, which includes the walk, lunch, and shuttle service. Mother’s Day Buffet, May 14 – Canaan will host a Mother’s Day buffet in the Hickory Dining Room from 12 p.m. to 6 p.m. Reservations are suggested for seating times at noon and 1:30, 3, and 4:30 p.m.
Memorial Weekend Celebration/ArtSpring, May 26-29 – This annual Tucker County event at Canaan Valley includes exhibits and presentations by local artists as well as guided hikes, supervised crafts, bonfires, and a golf scramble. Murder Mystery Dinner Show, May 27 – “The Murderer Who Came to Dinner” includes dinner and a dramatic performance. Guests who solve the mystery win a prize. Tickets to the show and dinner are $50 per person plus tax. Lodging specials are available for the weekend. Blackbird Knob, Dolly Sods Hike, May 27 – The guided, six-mile, physically challenging hike between Blackbird Knob and Canaan Valley offers spectacular vista and high-meadow views. The resort offers a shuttle from the main lodge at 9 a.m. Guests are encouraged to pack a lunch, snacks and water. The cost is $15 per person, and the hike is limited to eight participants. Pre-registration is required. The hike will be repeated on June 10. Memorial Day Golf Scramble, May 29 – This annual, popular 18-hole golf scramble is open to guests and golf course pass-holders. The scramble begins at 1 p.m., and a variety of prizes will be awarded. The basic entry fee is $55 per person, with a discounted entry fee of $35 for season pass-holders. Golfers can register at the Canaan Valley Pro Shop or by calling 304-866-4121, ext. 2632. Canaan Valley Resort in 2013 completed a $34 million renovation that included construction of two new wings with all-new guest rooms. The resort’s offerings also include the restaurants, lounge, fitness center, indoor and outdoor pools, an 18-hole championship golf course, tennis court, miniature golf, horseshoe pits, playground, sand volleyball court, soccer field, softball diamond, basketball court, corn-hole toss, Euro-bungy, scenic chairlift, tubing the “Turtle Slide,” climbing wall and clay trap shooting. 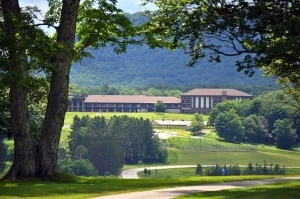 Canaan Valley Resort is three hours from Pittsburgh, 2 ½ hours from Washington, D.C. and 2¾ hours from Charleston, W.Va. The drive from D.C. to Canaan Valley has recently become quicker and easier with the near-completion of the section of “Appalachian Corridor H” in West Virginia between the towns of Bismarck and Davis.